On top of crafting mouth-watering recipes, fresh from the farm to your fork, Jordana Rebner – our beloved Culinary Director – strongly believes great tasting food can be achieved through a brilliant balance of flavours. The art of balance with a clear culinary game-plan and fresh ingredients is a far better alternative than quick wins like senseless salt shaking or being a frequent fryer. If you’ve ever tuned into the Food Network, you’ve probably heard of the notion of flavour profiling. Beyond being a buzzword, this crucial cooking skill is all about knowing the overall strengths of each and every one of your ingredients to mix and match accordingly. The five basic tastes are another good place to start: sweet, sour, bitter, salty and savory (a.k.a. umami). Often enhancing or offsetting each other, the flavourful-five are the very foundation of any great tasting dish. For instance, the sour side of a lime can diffuse the spiciness of a jalapeño, while brightening the sweetness of a tomato – did someone say pico de gallo? Beyond the five basic tastes, aromas and textures can also be your allies. In order to play with the pico’s flavour profile, we decided to drop the spicy jalapeño and pungent onion in favour of mango and jicama for a sweeter, crunchier bite! 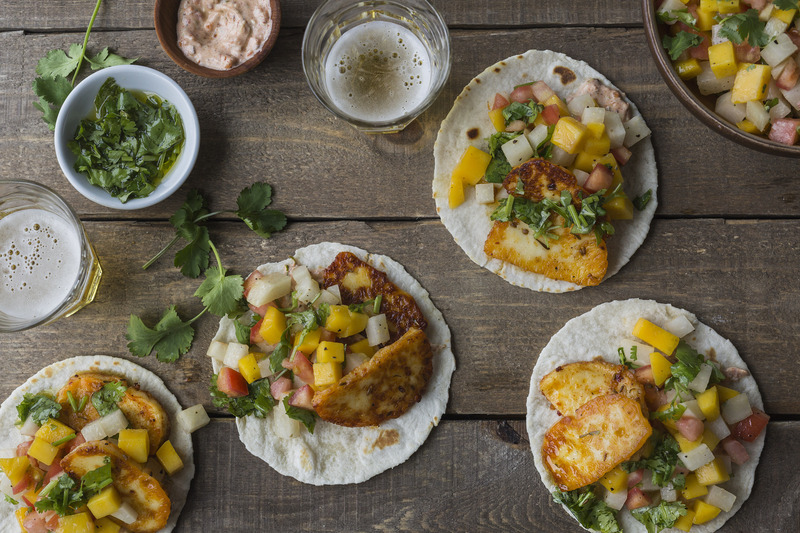 Now that we’re done with the theory, let’s turn this lesson into reality with our souped-up version of pico de gallo alongside scrumptious halloumi tacos. Check out more examples on this week’s menu!